Now, I am NOT one to defend the increases or essentially anything that OC Nogo proposes, but in this case I have to (gag!) set that aside. Planning future revenues is essential to any business and the better the projections the better informed the business decisions. The Ottawa transit goofs are no different. They need good information on ridership to be able to make decisions on everything from capital investments to staffing. Plus, single tickets and monthly passes mean higher administrative costs than those associated with passes of longer durations; say annual or per semester passes. As the handy-dandy table below illustrates, there is an attempt to get commuters to commit to a transit pass of longer duration. 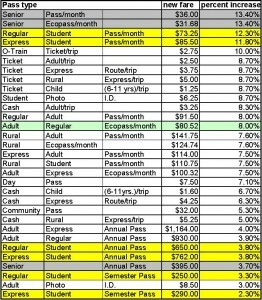 Thus the fee adjustment are lower for the annual and semester passes and higher for single tickets and monthly passes. This is not new. OC Transpo, and I suspect most public transit organizations, have been moving in this direction for quite some time. Look at the bottom of the scale and you can see that student passes (in yellow and senior passes (in grey, of course) are increasing only marginally. all of the other increases fall somewhere between the two (my pass is coloured green in the table above). While I don’t think for a moment that the increases in costs will result in better service, I can appreciate why OC Transpo is structuring their fee increases in such a manner. Sure, it is a bit harder to come up with the higher up-front annual fee – especially for those on fixed incomes – but the City is giving everyone about 8 months to put aside the money. A senior need only save $50 per month in order to purchase an annual pass next summer. Even for most pensioners, that’s really not much to ask, is it?